This course enables students from intermediate level upwards to develop the skills needed for English-medium study at post-secondary level. 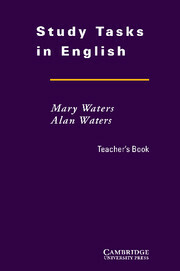 The main features of Study Tasks in English are: * A task-based approach. Whenever possible, students learn the skills they need through discovery and induction rather than telling. * Study skills and study competence. The course helps students to develop the underlying competence necessary for successful study - eg problem solving, thinking critically and creatively. * Awareness-building. Each unit ends with a self-assessment and application section, to help learners actively draw together the skills which they have focused on in the unit. * Study Practice in English. The Study Practice section provides four major study simulations to consolidate and give further practice through an integrated study cycle. an introduction explaining the methodological principles underlying the book. 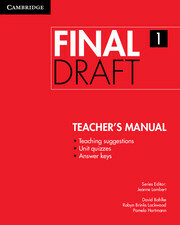 helpful notes about how to use the book in the classroom as well as answers to tasks. tapescripts for the listening material which appears on the accompanying cassette.